More and more home sellers are discovering the tremendous costs savings when they act as their own real estate agent. You can too if you are willing to show your home, answer inquiries and help advertise your home. When you choose to take an active role in selling your own real estate you can save yourself thousands of dollars that you would normally pay in commissions. On the sale of a $300,000 home you would pay $15,000 in sales commissions based upon a standard 5% rate. Add to that the cost for legal services and conveyancing and your total costs could exceed $16,000. 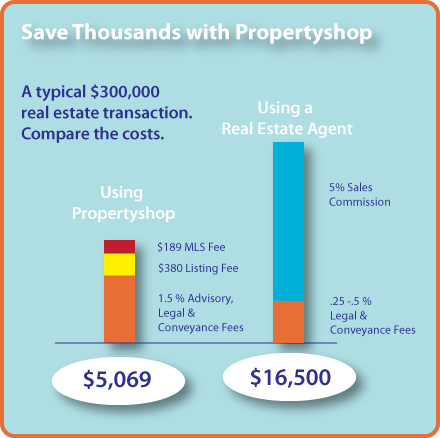 Using Propertyshop you eliminate the standard real estate sales commission. Your property shop lawyer will assist you to get your property listed, help with negotiations and provide all of the associated legal services and conveyancing costs. For those services you will pay an average of 1.5%. The only additional costs are the standard Propertyshop web site listing of $450 and the MLS® system databases listing fee to advertise on Realtor.ca® if you choose to use that service. These costs would total approximately $5,000. In the province of Ontario and most other jurisdictions in Canada g real estate transaction require a lawyer to be involved and there are always associated conveyancing costs.